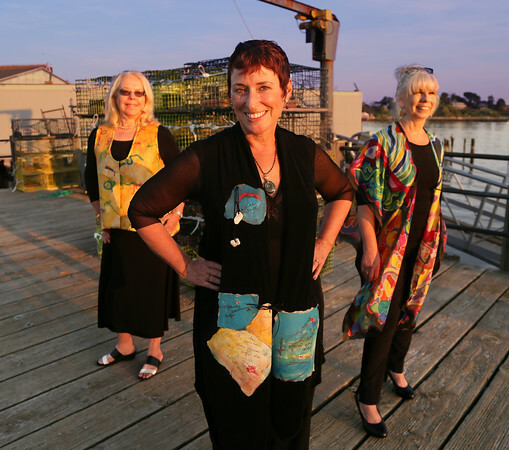 Pamela Bynum, center, Carolyn Fuchs, left, and Beth Williams model hand-made vests that will be part of the Wearable Art III fashion show Sunday, Sept. 27 in Gloucester. Bynum is wearing an Agean-themed long vest with patches over black. Fuchs has on a Sinikka Nogelo vest made from recycled silk. And Williams is wearing a hand-painted silk kimono vest created by 10 artists from Ten Pound Studio.